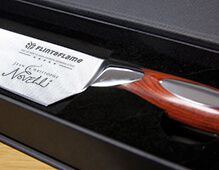 Whether for customers, employees or maybe even as a corporate award, our knife engraving offers you an opportunity to add your branding to a high quality product. If you wish to add your logo or a corporate message to a knife or set of knives, please call us on 01403 740 230 to discuss your requirements. Whether for yourself or as a gift, adding a name and/or personal message is the perfect finishing touch to a Flint & Flame knife. Find the Flint & Flame product you wish to engrave within our shop. On the product page you will see the ‘Engraving Options’ section. There are 3 areas on a knife where can add your personalisation (as shown on the image below). Type in the message you wish to have engraved on the knife in the relevant boxes (you can fill in just one, two or all three – whatever you prefer). Select your font from the dropdown menu. Go through to checkout and complete your order, we’ll do the rest! If you have any questions or would like to discuss anything please call us on 01403 740 230.